You have an awesome chance today on DAY FIVE of our 12 festive giveaways in 12 days to enter for a chance to Win How Cities Work from Lonely Planet Kids to the lucky winner on our chosen day. Get ready to explore the city in a whole new way: inside, outside and underground. 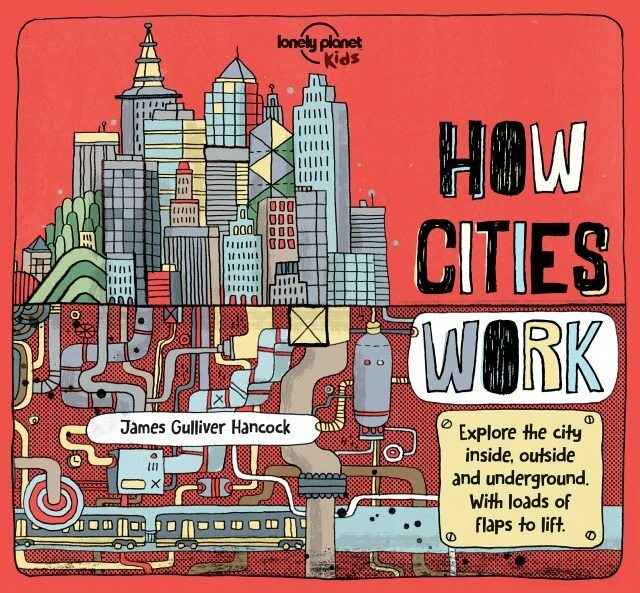 How Cities Work is an innovative book for young readers and is packed with city facts, loads of flaps to lift and unfolding pages to see inside buildings and under the streets. Children aged 7+ can learn about skyscrapers, underground systems and stinky sewers. Discover where people live and peek behind closed doors to see what’s going on in houses and apartments – or why not find out what goes on beneath the streets you walk on every day? Each page of How Cities Work is stylishly illustrated by James Gulliver Hancock, creator of the All The Buildings That I’ve Drawn So Far series and there are loads of quirky details to spot. How many giant cowboy hats can you find through the book? Lets not waste any more time. Here is the entry widget and we do wish you best of luck! This competition ends at 11.59pm on the Saturday 17th of December. We will announce the winner as soon as we can after the close date so that we can endeavour to get the prize out before Christmas. We cannot, however, guarantee this. All our standard terms and conditions apply, and this is for UK and Ireland delivery only. Visit Lonely Planet Kids to find out more about their awesome products for kids. I think that Unfolding Journeys: Amazon Adventure looks really good. You rule! I think my kids would love to rule a country, although god help the inhabitants!! Busy places sounds great, it’s the one I’d choose next to buy! I love the Unfolding Journeys: Amazon Adventure, as it looks really interesting. Thanks for the giveaway. We travel to Europe by car quite a lot so the ‘Boredom Buster-games for the road’ looks like a great resource! Let’s explore the jungle sounds great! The London City Trails – lots of fun routes to try! The Boredom Buster (AU/UK edition) looks great for when we’re on long journeys, it’s so hard to keep them occupied! I like Amazon adventures the best. Amazon Adventure, my son is learning the Amazon rainforest at school and is loving the subject, so he would love to read this book. To be honest they all look amazing! A very exciting way to teach our children, but I really love the idea of the Amazing World Atlas! How to be a space explorer looks right up my sons alley! I personally love the concept of You Rule! because I did similar activities when teaching. But I think my daughter would like Pop Up London. Seems more age appropriate. There are so many that my girls would like, but I’m going to say ‘How to be a Space Explorer’ as she really enjoyed learning about Tim Peak in space. The Travel Book. It says that it covers every country in the world, which is really cool. Not for parents-How to be a Dinosaur Hunter…..Why do kids love dinosaurs so much? would they if they were still around? Not For Parents: How to be a Dinosaur Hunter – My little boy loves Dinos!